IN FIREFLY VALLEY is the second book in the TEXAS CROSSROADS series. This is only my second Amanda Cabot novel… but I can assure you, it won’t be my last. Amanda writes a good story that quickly grabs your attention. I feel that I’m at a disadvantage here, since I haven’t read the first book of the series, but I’ll be on the lookout for it. After losing her job, Marisa St George returns to the small town she grew up in and takes a job as manager at the Rainbow’s End resort. Although she plans for the move to be temporary, she has no idea what the future holds for her… right where she is! 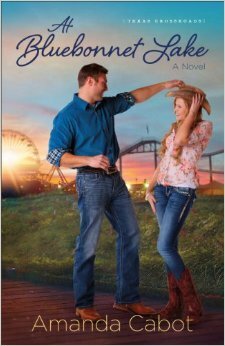 When he meets her, Blake Kendall is immediately attracted to Marisa. It’s not long before she finds herself on a date with someone she fancies she’d like to know better. The only problem is, she doesn’t have a clue who Blake really is… and when she finally learns his secret – watch out! Amanda does a great job creating a heart-warming story with intriguing characters who are full of hope, love and searching for the faith they need to trust again. Don’t miss out on this spectacular series! I can’t wait to read the third book in the series, On Lone Star Trail, which will be coming out Spring 2016. She’s lost her dream job–but has she found the man of her dreams? I received this book free in exchange for an honest review from Revell Reads! Oddly enough, the synopsis for this book brings one of my absolute favorite movies to mind. Young girl, shy and introverted – goes to Paris and returns all grown up. Of course my favorite version is the 1995 remake with Julia Ormond, Greg Kinnear and Harrison Ford… not the original with Audrey Hepburn, William Holden and Humphrey Bogart – which is ultimately sadder and holds a much darker theme. 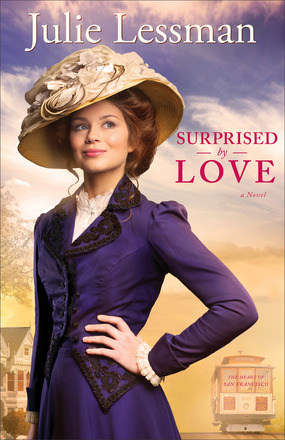 Surprised by Love is a wonderful Historical adventure – full of forgiveness, romance and of course.. surprise. I was thoroughly intrigued by the wonderful story – and was surprised to discover that this is the third book in a series. It does not read that way. You should have no trouble at all with feeling lost in the midst of a series. Megan is not at all what I pictured from reading the back cover copy. She is a bit of a spitfire – which makes perfect sense when you consider that she has taken an internship in the District Attorney’s office. I am not about to spoil the outcome for you – you will HAVE to read it for yourself but I will tell you that it surprised me! This is not a book to miss! And of course now… I have to go hunt down more books. LOL! She can turn the head of the man who spurned her–but can she turn his heart? When Megan McClare left San Francisco to study in Paris, no one would accuse her of being poised and pretty. But on the other side of the Atlantic, this wallflower blossomed into a beauty with big dreams. When she returns to California and accepts an internship at the district attorney’s office, she’s thrilled that her life is taking shape. But the exciting opportunity quickly loses its glow when she discovers she’ll be working alongside Devin Caldwell, who mercilessly mocked her at school–and with whom she was hopelessly enamored. 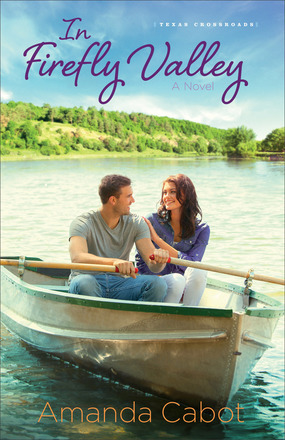 Bram Hughes is the best friend to whom Megan has always turned for support and advice. But when she seeks his counsel about working with Devin Caldwell, Bram’s vision is clouded by his sudden unwelcome attraction to a girl he had always thought of as a little sister. He advises forgiveness, but can he forgive himself for pushing the woman he loves into the arms of another man? Author Julie Lessman draws a romantic triangle that will touch your heart in this glittering Gilded Age tale of transforming love. Teens today need better role models – role models like the ones in Melody Carlson’s books! No, they’re not perfect… but who is! At least there is a strong moral to Melody’s story. One of which is that it’s never a good idea to tell a lie. Having an Amish pen pal has really gained popularity in recent years and it’s really exciting to read about such a unique experience. Ironically, I recently had a similar experience myself – several people made the comment that they thought “JC” was a man… which is why I’ve now posted my picture – to be certain everyone knows I am not, in fact, a man. And don’t you want to know what happens with Micah and her pen pal when he finds out she is also not a boy…? Not a story to be missed! And so exciting that I have a wonderful book that I can pass on to my daughter in a few years – I say a few years because she’s only 8 at the moment – although now that I think about it, she could probably handle it now because she’s incredibly mature for her age. And she LOVES to read! Just as I know you will LOVE to read this book! And now I am going to go in search of more books by Melody Carlson! The truth may set you free–but it might also land you in some uncomfortably hot water. Over the years, Micah Knight has exchanged many letters–and many secrets–with her longtime Amish pen pal, Zach. But Micah’s kept quiet on the biggest secret of all–the fact that despite her name, she’s a girl. Now Micah finally has the chance to meet her pen pal face-to-face. She wants nothing more than to experience life on Zach’s Amish farm, but she’s more than a little anxious. Will he be angry at her for deceiving him all these years? And will she risk losing his friendship to find something more? My review of “The Christmas Cat” by Melody Carlson | Stop #10 of my Salute to Christmas Reads! Well this book was NOTHING like I expected. I did not expect to fall madly in love with a quick, cute, little Christmas story but fall madly in love with The Christmas Cat – I did! Melody Carlson has a talent! No wonder she has so many successful books on the market today! Though that’s not to say the book holds no adventure. Who could possibly place a horde of cats with happy homes before Christmas – without a little adventure. But there is no race other than the one our main character builds up for himself. Garrison has felt lost for so long and just when he thinks he has finally begun to find a place to fit, doubt sets in and he flees faster that a turkey at Thanksgiving. If you’re asking yourself how a man who is allergic to cats can find peace, home and eventually his way in life – because of cats, then you better just read the book because I’m NOT going to spoil it for you! And thankfully, Melody has quite a few of these charming stories, so when you’re done with this one, you can go track down her others too! He felt his face flushing as Cara opened the door. Wearing a garnet-colored knit dress and with her dark hair pinned up, she looked even prettier than he remembered. Suddenly he wished he’d thought to bring a hostess gift. Like a cat. After years abroad, Garrison Brown finds himself at the home of his beloved grandmother who has just passed away. He must sort out her belongings, including six cats who need new homes. While he hopes to dispense with the task quickly–especially since he is severely allergic to cats–his grandmother’s instructions don’t allow for speed. She has left some challenging requirements for the future homes of her furry friends. At Bluebonnet Lake by Amanda Cabot | I know… I know… Another book that’s not a Christmas story. Romance works any time of year! Several comments were made about formatting in one review I read – and while it was later revealed to have been a digital ARC (which would explain the typos and funky formatting), I can understand how it would make the book difficult to read. Part of what writers are told over and over and over again is that we must get our spelling, grammar and wording right so that our readers are not pulled out of the story world! I was fortunate enough to have a paperback copy of the book (not an ARC) so I did not have these problems – thankfully! And I believe many other reviewers who didn’t love the book had a problem because they had read Amanda Cabot’s historical fiction. That can be a difficult transition but perhaps it was only easier for me because I have never read Amanda Cabot’s historical fiction. I LOVE the idea of the book! A Christian resort. And hey, isn’t part of the fun of a getaway… to get away! No cell service certainly sounds like just the thing! Of course for a spunky gal who is married to her job – I can understand being bugged by a serious lack of cell service! Amanda certainly has the characters pegged! And as far as I can tell, she didn’t have any difficulty transitioning from Historical fiction to contemporary! I’ve also noticed several people having issues with “Grandma” taking such a central role in the story but I have to say I find it refreshing! Too many people overlook our fantastic matriarchs (and patriarchs)! psst… another series I just LOVE features a spunky Grandma and Grandpa – and they are my favorite part of each book! Her life is set to warp speed. His is slowing to a crawl. But love has its own timing. Marketing maven Kate Sherwood’s world is fast-paced, challenging, and always changing. The last thing she wants to do is grind to a halt at Rainbow’s End, a dilapidated resort in the Texas Hill Country. Still, she cannot deny her ailing grandmother’s request to visit the place where she and her deceased husband spent one glorious week fifty years ago. There, Kate meets Greg, who appears to be the resort’s unassuming handyman. But there’s more to Greg than meets the eye–billions more, in fact. Kate isn’t looking for romance, but she can’t deny the sparks of attraction that fly every time she and Greg are together. Could there be a future there? Or will Kate’s long-sought promotion take her back to the big city? Amanda Cabot invites you to step into a place away from the pressures of the day. You might be surprised by what you find at Rainbow’s End. Well Rob and Joanna Teigen certainly have shared the advice of a “village” worth of experts – and in this case “expert” does not only mean someone who has been taught, tested and certified in the “study” of children. In the case of A Mom’s Prayers For Her Son, “expert” means other parents, pastors and fellow authors. If you are a mother…or you know a mother who has a young son, this book is an excellent choice! This book is for those of us who are NOT so gifted. Sometimes you just don’t know what to pray about and if you are a mother, you really need to know! So buy this book, read this book, and do whatever you need to do to implement this book into your daily prayer routine! Your son will thank you. His future wife will thank you! People you’ve never met before will one day thank you! Praying for sons (and daughters) is one of the most important things we as parents can do! When a mother looks into the eyes of her son for the first time, her heart is filled with love–and questions. “How do I raise a boy? What struggles will he go through? What kind of a man will he grow up to be?” She wants to pray for her son, but may not know just what to pray for. Now the couple who brought you “A Dad’s Prayers for His Daughter “turns to a mother’s unique relationship with her son. They assure Mom that even if she isn’t always sure what kind of support her son needs, God always knows. 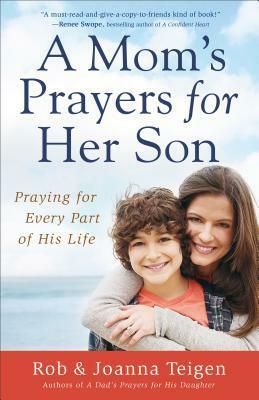 Providing specific prayers moms can use, along with stories from other moms about how God has answered their prayers for their sons, Rob and Joanna Teigen give women a strong foundation to build a lifelong habit of prayer for their sons. They also explain a little more about boys and what they need to learn growing up, including character, courage, self-control, forgiveness, and more, so a mom can pray for every area of her son’s life. Believe it or not, this is the first book by Dan Walsh that I have read. I’m not in that category anymore. LOL! And what a place to start… WOW! I mean… does it get any more intriguing than that! Right there, you have a perfect formula for hooking your reader. And is there a person on the planet who could put the book down before they find out who Michelle is and why she torments herself by doing… whatever it is she’s doing at the opening of this story (NO! I’m not telling. Trust me – you WANT to read this book). Don’t worry about not having read any of the other books in this series, if you’re starting here with book 3 – although I’m sure you will want to read them all AFTER you read this one! I know I do! I will warn you. I’m a Mercy (spiritual gift) so I tend to bawl over just about anything so it’s probably not a really good idea to judge your probability of needing an entire box of tissues just to get through this book… usually. With this book, I think more people than think they would, are going to need just that. “The Desire” by Dan Walsh and Gary Smalley explores some pretty tough emotions and it doesn’t really matter if you’ve been there or not, they make the emotions so real, you feel like you have. Can faith build a bridge between their dreams? For two years, Allan and Michele have been trying to have a baby. The emotional ride has been taking a toll on their hearts–and their relationship. Michele is obsessed with researching fertility treatments while Allan seems content to spend his time–and their money–on supporting displaced children in Africa. Something’s got to give. But they both hope it’s not their marriage. Still, God has a plan for Allan and Michele that they could never have imagined. And all it takes to set it in motion is a change of heart . . .
from the Revell Reads review program. (CLOSED) Giveaway! 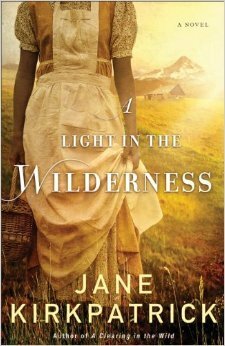 | A Light in The Wilderness by Jane Kirkpatrick | Based on a True Story! Have you started reading A Light in the Wilderness yet! Would you like to win a copy? I am excited to announce that Revell Books has provided a book for me to GIVE AWAY to one blessed winner! 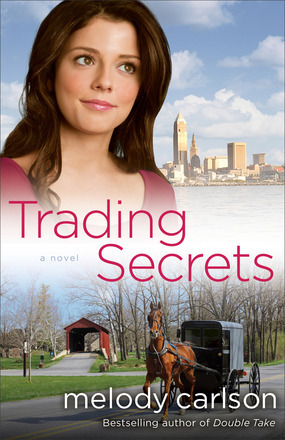 Jane Kirkpatrick certainly has a way with retelling true stories. I previously read and reviewed her Emma of Aurora Trilogy and this is just as wonderfully done! It is difficult enough to write an accurate Historical novel but to write about real people and real events and do it with a fictional flair – well, that takes real skill! The idea of freedom has intrigued people for centuries. It had inspired explorers and spurred on tired travelers and Jane has used that same fire to drive her re-telling of the story behind “A Light in the Wilderness”. If all history books were so entertaining and heart-wrenching, maybe school children everywhere would have an easier time remembering the facts and figures and dates and events that fill History books. It’s clear Jane has done her homework here. Yes, there are things that can not be known about these historical figures but Jane fills in those details in a way that rings absolutely true and serves to add to the story of their documented experiences. Three very different women. One dangerous journey. And a future that seems just out of reach. Letitia holds nothing more dear than the papers that prove she is no longer a slave. They may not cause most white folks to treat her like a human being, but at least they show she is free. She trusts in those words she cannot read–as she is beginning to trust in Davey Carson, an Irish immigrant cattleman who wants her to come west with him. Nancy Hawkins is loathe to leave her settled life for the treacherous journey by wagon train, but she is so deeply in love with her husband and she knows she will follow him anywhere–even when the trek exacts a terrible cost. Betsy is a Kalapuya Indian, the last remnant of a once proud tribe in the Willamette Valley in Oregon territory. She spends her time trying to impart the wisdom and ways of her people to her grandson. But she will soon have another person to care for. As season turns to season, suspicion turns to friendship, and fear turns to courage, three spirited women will discover what it means to be truly free in a land that makes promises it cannot fulfill. This multilayered story from bestselling author Jane Kirkpatrick will grip your heart and mind as you travel on the dusty and dangerous Oregon Trail into the boundless American West. Based on a true story. Thankfully, Jesus said we don’t “live on bread alone”–that includes cupcakes–“but on every word that comes from the mouth of God” (Matt. 4:4). What we really need is truth. If you’re tired, discouraged, or feel a little empty inside, my prayer is that by the end of our time together, you’ll be refreshed and nourished in a way that will sustain you through whatever the future may hold. Remember, you’re not alone, my friend. 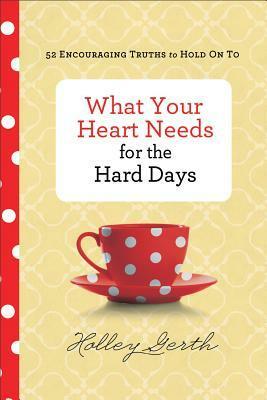 In this uplifting book, Holley Gerth invites you to be filled with the strength, peace, and joy that come from God’s promises. Each of the 52 devotions based on the Psalms will help you remember that God is good and we’re all in this together. Holley Gerth is a bestselling writer, certified life coach, and speaker. She loves connecting with the hearts of women through her popular blog and books like You’re Already Amazing, You’re Made for a God-Sized Dream, Opening the Door to Your God-Sized Dream, and You’re Going to Be Okay. She’s also cofounder of (in)courage and a partner with DaySpring. Holley lives with her husband, Mark, in the South. Learn more at http://www.holleygerth.com. This book is the perfect companion to Holley’s book You’re Going to Be Okay. All you have to do is LOOK at it and it will cheer you up! Yes I am a sucker for a cute little book that has a coffee cup on the cover… but that is only a part of this book’s charm! Just wait til you get a look inside! Holley Gerth is a genius! She has put together a beautiful, endearing, uplifting book and anyone – absolutely anyone can find something inside that will apply to their life! Yes it is set up so that you can read and study one concept each week for 52 weeks of the year but I don’t think many of you will want to stop reading once you get started! It is such a comfort to find good, Biblical advice, especially in this crazy, upside down world we live in. And I absolutely love the little sections provided at the end of each chapter for notes, the bible verses and the wonderful prompts. Not only does Holley delve deep into what the Bible tells us Jesus wants for us – she draws us in and interacts with us while doing it. I am compelled to go out and find more of Holley’s wonderful books and I hope you will feel the same! Why oh why haven’t I seen these fantastic little books before! This is a book that everyone needs to have handy for those everyday challenges that make us feel worn out and defeated – along with their personal Bible of course. To help with that, I am excited to announce that Revell Books has provided a book for me to GIVE AWAY to one blessed winner! The giveaway has ended now. Also, I wanted to let you in on some exciting news from Holley Gerth herself! I’m not 100% sure what actually happened here. I think my iPhone is actually responsible for me “requesting” this book. I say that because “Death Takes a Ride” is nowhere near my usual type of book… but you know that thing that your phone does on an internet page – you tap the screen and it moves just as your finger touches it and you’ve instead selected something halfway down the page from what you were just looking at. Yeah, mine does that all the time. Yes, this is the third book in the series and No, I haven’t read the first two but that would definitely not be a good enough reason NOT to read this book! Lorena McCourtney smoothly brings us up to speed and lets us in on the pattern in these novels with only a few short sentences. And she does it in a way that adds to the story without distracting you one bit from the plot. As with most Mystery series, you have at least one character who finds themselves in the middle of a sticky situation at least once in each book and this one is no different. I LOVE that Cate’s faith is woven into each scene of the book – helping her get through these tough situations and tricky investigations. I do believe I have found a NEW mystery series that I’m just going to LOVE! Most of you remember my review a few months ago of an Amish Mystery that I did not expect to enjoy as much as I did either. Apparently my problem was that the mysteries I read years ago that almost completely turned me off to the genre were not even remotely inspirational in nature. They relied on inappropriate relationships and believing impossible things about the characters to keep readers interested. This book, like the Amish one, DOES NOT do any of that! Which of course means that I LOVE it and will happily recommend it to EVERYONE! It’s official. This case is above her pay grade–and Cate’s in over her head. Cate Kinkaid arrives at H&B Vintage Auto Restorations to give a friend a ride. But, as usual, trouble finds Cate even there–this time in the form of one dead man, one wounded man, and what appears to be a pretty obvious case of self-defense. Despite having been merely an unfortunate bystander, Cate finds herself sucked into the case. And the deeper she gets, the more she begins to suspect that the shooting in the H&B office may not have been as cut-and-dried as it appeared. 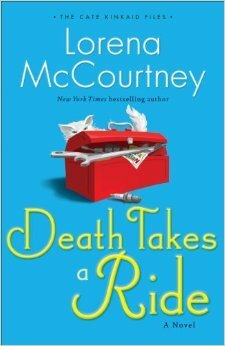 Bestselling and award-winning author Lorena McCourtney takes you on wild ride in this clever cozy mystery that will keep you guessing. from the Revell Reads blogger program. 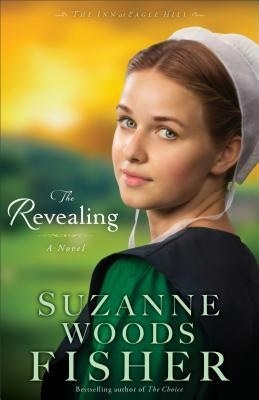 My review for “THE REVEALING” | Book 3 in Suzanne Woods Fisher’s “The Inn at Eagle Hill” seres | The one we’ve all been waiting for! I don’t know about you but I’ve been waiting for this book a LONG time. If you’re wondering why I almost didn’t read the series, click HERE for the post that explains it. Anyway, we’re here to talk about this latest book in Suzanne Woods Fisher’s The Inn at Eagle Hill series. How can this be the last book in the series. It’s simply too sad. The stories are so wonderful, I wish so much that there were to be more. My only hope is that Suzanne will use the same community in her next series – at least then we might get a glimpse now and then of our favorites. The Revealing is one of those books that brings you to your knees, completely and absolutely. About halfway through the book, everything and everyone is in such a mess – you wonder how anything could ever come out right. But in that unerring way that those of us who see God’s will in our lives know, all things come together for the good of His children. Sometimes the best things even come from the worst possible mess you can imagine. And do not be fooled, there are so many things that come about in a way I never could have seen coming. 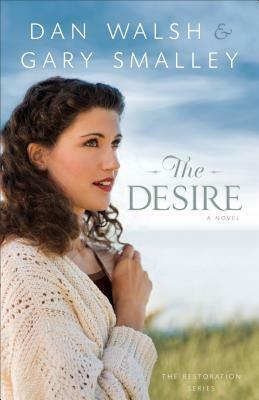 Suzanne Woods Fisher has penned a beautiful tale of love, forgiveness and hope. It is an amazing journey and, though I bawled like a baby when I turned the page to find no more – I would read it all over again… and again… and again, just to experience that wonder again! And I sincerely hope to see another wonderful series from Suzanne soon! In the meantime, I am going to go back and catch up on all her books that came before this series! Love does extraordinary things to people . . . In a single, impulsive act, Naomi King chooses to follow her heart into unfamiliar territory, jeopardizing all that she holds dear. If anyone finds out what she’s up to, she’s in for trouble. But when it comes to Tobe Schrock, Naomi believes it’s worth it. 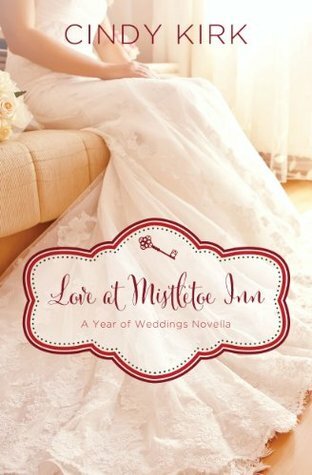 But it all comes crashing down when a young woman arrives at the Inn at Eagle Hill with an unexpected delivery for Tobe. Add a guest at the inn with a curious talent and a genealogist who is more interested in modern-day Schrocks than in old family trees, and evidence starts to mount that points to something sinister at work. Or someone. In this riveting conclusion to The Inn at Eagle Hill series, bestselling author Suzanne Woods Fisher pulls out all the stops with a fast-paced tale of deception, revelation, and romance.